The first issue of Living Hyphen, Entrances and Exists, launched on October 12, 2018. The print magazine is an intimate journal that amplifies the experiences of hyphenated Canadians through artistic expression, not limited to short stories, photography, poetry and illustrations. Through the art of storytelling, Living Hyphen analyzes how life is lived between cultures, by the people who call Canada home while too having roots in different countries, on different continents. The stories, while beautiful, honest and raw, also express heartbreak, contradiction, commemoration and everlasting change. Volume one explores the stories of people like a Haitian woman on the Montréal Metro, a trans man applying for permanent residency and a young Filipino woman texting with her mother. We connect with Justine Abigail Yu, Founder and Editor in Chief, to discuss how the Living Hyphen team is reshaping Canadian print media standards, shifting power and providing a platform to empower people whose voices often remain unheard. Justine Abigail Yu with Living Hyphen contributors. Left to right: Natasha Ramoutar, Jasmin Elysia, Aeman Ansari, Lance Morrison, Justine Abigail Yu, Joelle Kidd, Victoria Liao, Rachel Evangeline Chiong. Photo by: Goodbird. What was the lead up like to the launch of Entrances and Exits? Surreal. Exhausting. Exhilarating. Nerve-wracking. Rewarding and so, so profound. As the Founder and Editor in Chief of Living Hyphen, how many hours would you say you put into this first issue and preparing for launch day? I work another full-time job and Living Hyphen is my passion project, my side hustle. For the most part, I only really had the weekends and the odd late nights for the magazine. In the lead up to launch day, the time commitment definitely ramped up with finalizing the printing, actively promoting the magazine across social media, radio and television, securing a venue for the launch party and organizing the actual event in terms of volunteers, performers and food. Let’s just say I didn’t sleep very much in the last month prior to launch! What was the hardest part about preparing volume one? What did you learn from this challenge? This marks my first time ever putting together a print publication and every step was a challenge simply because I had no frame of reference. From curating the submissions to researching and negotiating printing costs, from designing the layout of the magazine to figuring out how to set up an online store – this was an entirely new world to me. I spent a lot of time talking to and building relationships with people in the arts communities, entrepreneurs, small business owners and people who work in print and publishing. They taught me about the different facets of this process and industry. It was overwhelming, exciting, anxiety-inducing, challenging and empowering, all at once. Out of all these challenges, selecting the pieces to be included in this inaugural issue was probably the most difficult of them all. We received over 200 submissions from artists and writers across Canada. The stories we received were all deeply personal and vulnerable. The selection and editorial process brought up existential questions around power for me – whose stories do we choose to tell? Who am I to say whose stories get published or printed? Who is anyone, really? I saw for the first time the very real power that editors and publishers have as gatekeepers of stories in our society. Though I don’t have the complete answers to these questions yet, I learned a whole lot about being conscious of my own biases and blind spots and the importance of having other perspectives to combat that. I learned in a very real and tangible way the importance of diversity in making editorial choices; that power should not be held exclusively by one person or one homogenous group of people. Why was it so important for you to create Living Hyphen? I’m Filipino-Canadian. I was born in Manila, Philippines and moved to Toronto when I was just four-years-old. I’m in my late twenties now and my life has been a constant tug of war, an ongoing push and pull of these two places, two cultures, two identities. In short, it has been a life of living in between, of living in the hyphen. Over the last few years, I’ve been on an intense journey examining my identity. I have a complicated relationship around my culture, our food, our language and our people – a complex tension lives between shame and pride. It’s only recently that I’ve really interrogated those feelings deep enough to understand how colonialism, white supremacy and internalized racism have been so deeply ingrained in my psyche. It’s only recently that I’ve more fully embraced my Filipino heritage. As I connected with people within the Filipino diaspora and other ethnic communities, I realized that my experience was not unique, that there are so many of us who feel this way, who are asking hard questions and who are at different stages of the journey in reconciling with our hyphenated identities. I knew it was important to create a space where we could examine all these tensions and complexities together. From where did the idea for Living Hyphen stem? The seed of this idea came from a panel I attended at Toronto’s Feminist Art Conference way back in 2015. The panel was made up of writers of colour and they were discussing the (the lack of) diversity in Canadian literature. They spoke of their experiences in the publishing industry and the difficulties they faced in trying to get their work published. One of the panelists who was Japanese-Canadian shared her story of how the manuscript for her novel was returned with feedback from the editor indicating it wasn’t, “Japanese enough.” And it baffled her because as someone of Japanese descent – how could her story not be “Japanese enough?” Who gets to dictate what is or is not Japanese? The other panelists shared similar experiences of their stories being rejected for not conforming to the “Canadian narrative” or not being “ethnic” enough. It would seem that the homogeneity (read: whiteness) of the publishing industry has created a very narrow conception of what our stories are as people of colour. Our stories are meant to conform to stereotypes or archetypes that have very little basis in our individual, nuanced and complex experiences. As a Filipina-Canadian with my own unique story to tell, this deeply unsettled me. I knew I had to do something. I couldn’t keep knocking waiting for the powers that be to open their doors and welcome me into their space. I needed to build my own damn house! And that house is now Living Hyphen. Who makes up the Living Hyphen team? What are their roles? We’re currently a very small team. I act as Editor in Chief. Josh Layton is our Creative Director. And my mom, Jocelyn Yu, is our primary funder and publisher. Josh Layton and Justine Abigail Yu. Photo by: Goodbird. Who designed the cover of Entrances and Exits? Nicole Xu. She’s a freelance illustrator who was born in Shanghai, grew up in Vancouver and is now based in Brooklyn, NY. I connected with her through Women Who Draw, an open directory of professional illustrators, artists and cartoonists who identify as women. It was created by two women artists to increase the visibility of women illustrators, emphasizing women illustrators of colour, within the LGBTQ2S+ community and in other minority groups. How many contributors did you have for your first issue? How did you secure their support and commitment to creating content? Our inaugural issue is comprised of 50 artists hailing from 30+ ethnic backgrounds, religions and Indigenous nations. We put out a call for submissions back in August 2017 across different social media platforms and groups, and it just took off from there! The contributing artists and writers submitted pre-existing work and all accepted submissions were compensated. Many, if not all, of our contributors expressed excitement for our publication’s unique focus and how it’s filling a much-needed gap in Canada’s arts and literature scenes. This is a dedicated space for voices that have largely been marginalized and it is a powerful driving force for the support we’ve seen, both from our contributing artists and the public. As you’ve mentioned, all contributors to Living Hyphen were compensated. Why is this piece so important to you? All too often, our work as artists and writers is taken for granted. We’re often dangled opportunities to create “for exposure” instead of for money. As a writer, I know the amount of time, energy and most importantly, labour, that goes into my written pieces. It’s work…and it’s hard work! I strongly believe that our labour as writers and artists should be compensated, just as it would be in any profession. But even more than that, I would be remiss not to mention that it is even more difficult for people of colour to be compensated fairly and equally for their artistry. Despite being at the forefront of creating so much of our culture, we are rarely recognized and compensated for this valuable work that makes so many of our lives richer. And as Living Hyphen is a magazine that carries the voices of many (though not necessarily exclusively) artists and writers of colour, I felt it was of utmost importance to pay our contributors for their labour. What is the editing and review process like with Living Hyphen? As noted, this was a new role for me and one that I’m still coming into. I didn’t edit too much of our contributors’ works. Firstly, so many of the submissions were already so well done that I didn’t feel the need to change or edit much. Secondly, I really wanted to stay true to the voices of our contributors and what they wanted to communicate. I only lightly edited for punctuation, spelling, length and other minor elements. The editorial process was another piece that I struggled with on a more existential level. There were stories submitted to us where the writing – but more specifically, where the command of the English language – was not the best. English may not have been the creator’s first language. Does that render the story not worthy of being told? Does that require a complete re-write of someone’s voice? Is the strength of the story itself not enough? With a publication focused on stories of migration and living in a diaspora, I was highly conscious of these questions. I haven’t figured out the answers yet, but the questions themselves informed a lot of my editorial process and decisions. Some of your contributors also read their pieces at the launch of your first issue. What was this experience like for them? What about for your audiences? I can’t claim to speak for our contributors or audience, but I know that for me personally it was beautiful to hear these artists read their stories aloud. I had spent the last year reading and re-reading their work over and over again in my head, and to finally hear it in their voices was really something special! How did you choose the name Living Hyphen? We were originally called The Hyphen, but I changed the name after deeper reflection. Living Hyphen so perfectly captures the essence of being a part of a diaspora. We are exactly what the name suggests: living hyphens connecting people, places, and cultures…living bridges bringing complexity together in exploration, in tension and in celebration. Photo courtesy of: Living Hyphen. Why did you choose a print publication instead of an online space? Because the online world is, for the most part, free and open, marginalized voices have flourished there. It’s so easy and accessible now to start a blog or start a social media account to express yourself. There aren’t the same barriers in the online space that you would find in the “real world” of institutional power. This has accelerated a lot of critical conversations around race, gender and identity that would just take longer to disseminate in any other medium. I wanted to do something different. I’ve always been a big reader and I wanted to see myself and people like me represented on paper. There is power in seeing our stories in print, there is weight to the physical aspect of this medium. I really wanted Living Hyphen to be something you could touch, display and show off. How do you hope Living Hyphen will continue to stand out within the group of ever-growing Canadian independent publishers? I want Living Hyphen to be a premier space in Canadian arts and literature, one that celebrates all the complexities of diversity. I want to reshape the mainstream and to turn up the volume on voices that often go unheard. Who, or what, remained your source of motivation and inspiration in the months leading up to Entrances and Exits’ debut? The artists themselves. We’ve built this great community where we share other opportunities in the arts and literature spaces and lift our voices. Hearing from supporters has also been a huge source of motivation. To have people reach out through Facebook, Instagram, Twitter and email to share how excited they are that Living Hyphen exists – even before they’ve read our magazine! – that kind of belief in our work has gone a long way, allowing us to find the energy to put the publication out into the world. There is such a hunger for these diverse stories and knowing that is more than enough to keep us going! Which resources did you turn to when preparing for publication and launch? I turned to experienced people in Toronto’s arts community for advice and guidance in this process. Some of these incredible people who were so generous with their time include Jasmine Gui from the Project 40 Collective, Ilene Sova from the Feminist Art Collective, Léonicka Valcius from the Festival of Literary Diversity, Erin Kang from Stories of Ours and the team at Upping the Anti. These people have been doing the work in this space for years and I’m so grateful they took the time to share their own experiences with me. I also need to give extra love to Dimas De Campos from our printers at Andora Graphics. Dimas spent hours on the phone with me and in person at his office teaching me about paper, varnishes, binding and all the different points of the printing process. As someone who has no experience in this field, it was so significant to have someone personally walk me through. Dimas De Campos and Justine Abigail Yu. Photo by: Goodbird. What does 2019 look like for Living Hyphen? We’ll be continuing to push and promote our inaugural issue in the next few months. This is such an important publication and we want more hands on our pages and more eyes on our stories! And I’ll be completely transparent: 2019 will also be a time where we need to figure out our funding model and find ways to make ourselves more sustainable. Printing costs a lot of money. Compensating our contributors costs money. Paying our designer costs money. My labour should cost money, but it currently doesn’t. If we want to continue producing this magazine, we really need to find a way to make money! As soon as we do that, we’ll be putting out a call for submissions for our next issue. Stay tuned for these developments! Guests at the Living Hyphen launch party, with Aba Amuquandoh, artist (holding the magazine). Photo by: Goodbird. Thank you, Justine, for sharing your story with A Quarter Young. Readers, to purchase your copy of Entrances and Exits, visit www.livinghyphen.ca. 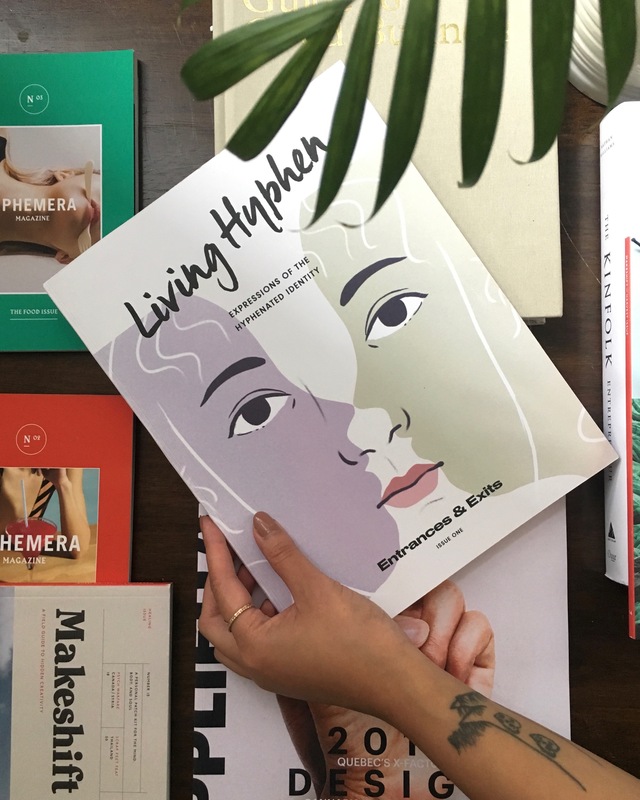 While Living Hyphen is primarily available for purchase online, Justine and team are hoping to source more shelves that will give their publication a home in bookstores, libraries and other shops. Do you own a shop or know somewhere that might want to host Living Hyphen? Please reach out to the team directly via email at: hello@livinghyphen.ca. Living Hyphen is always looking to collaborate and share stories with a wider audience. The feature photo courtesy of Living Hyphen.